On an overcast Saturday evening in South West London, Chelsea hosted Arsenal at Stamford Bridge. It was Chelsea manager Maurizio Sarri and Unai Emery coach their first ever home and away Premier League matches respectively. Initially, the lineups were slightly surprising. For Chelsea, they opted for the same starting eleven as in their away game at Huddersfield. This saw a repeat of their front 3 of William, Morata and Pedro. The surprise omission being star-man Eden Hazard, who must still be struggling from World Cup fatigue. Arsenal made just the one change; Iwobi in for Ramsey. This saw Özil take up a more central role. The surprising element of Arsenal’s lineup was the inclusion of certain players such as Granit Xhaka and Alex Iwobi. Also surprising was the exclusion of Lacazette. He had played so well after being brought on against City. The combination of that Mesut Özil moving centrally, and Arsenal having 2 natural wingers in Mkhitaryan and Iwobi, meant that they could counter the problem they faced at City with the full backs overlapping; something that was guaranteed to happen against Chelsea due to their attacking full backs. One worry I had about Chelsea’s lineup was whether their full backs, in particular Marcos Alonso, were too attacking. Alonso, who had been playing much further forward as a left wing back under Antonio Conte, now had to play as an outright left back under Sarri’s 4-at-the-back system. There were worries about his defensive abilities as a left back, as there were fewer people behind him to cover his mistakes. These defensive mistakes were apparent as Arsenal were constantly allowed past the last line of defence, enabling them to repeat the same cut-back routine time and time again. Despite this, the attacking ability Alonso showed as a left wing back remained on show, even as a left back. This was shown through his assist for Pedro’s goal, as well as his goal in the 81st minute to secure the win for Chelsea. The game started with promise for Arsenal. They were pressing well and attacked Chelsea from the off. Unfortunately for them this only lasted around 5 minutes. From that point, we began to see the same old problems at Arsenal that were on show towards the end of the Wenger era. In just the 9th minute, an in-form Pedro slotted the ball home from a simple ball from Marcos Alonso after exciting counter attack. 1-0 to Chelsea. For Chelsea’s first goal, Bellerín failed to track Alonso’s run down the left hand side, something that Bellerín did repeatedly under Arsène Wenger. This was something that Arsenal fans had hoped he would cut out his game under Unai Emery. It wasn’t just Bellerín this was the case for. It was also another usual suspect, Granit Xhaka, who just refuses to get back and defend when the opposition are on the counter attack. Tactically, both teams were relatively naive. Sarri’s teams are known for playing with a particular style. This style includes bunching a few Chelsea players in one corner of the pitch, drawing in a large number of Arsenal players. They then switch the ball to the opposite side of the pitch where there are acres of space for the Chelsea players to run into due to the bunching on the opposite side of the pitch. This tactic was evident for Chelsea’s first goal. Even though Chelsea didn’t score from this moment, this tactic was epitomised in the 68th minute. Sokratis went on a driving run down the left hand side of the pitch where he was then tackled. He stayed up there and drew other Arsenal players in, in order to maintain Emery’s vision of a “high press” whilst leaving the opposite side of the pitch exposed. From then, Chelsea just switched the ball and were on the counter attack. Fortunately for Arsenal and Sokratis, the attacked amounted to nothing. Arsenal’s high line caused themselves all sorts of problems. Even when Chelsea were attacking, at times, their line was at the halfway line. This just allowed Chelsea to play balls over the top and be through on goal. More of Arsenal’s old problems were on display for Morata’s goal to make it 2-0. In this case, it was Mustafi’s lack of defensive ability. As Morata, a player who is in very poor form, was driving forwards, Mustafi was all over the place, like Bambi on ice. He let Morata drive all the way from around the halfway line right down the middle of the pitch. Another factor that led to this goal, was the lack of Arsenal players willing to get back and help out Mustafi. After Morata made it 2-0 to the hosts, chants started all across Stamford Bridge singing the words “Are you Wenger in disguise?” at Arsenal Head Coach, Unai Emery. Chelsea suddenly became flat and lethargic, probably thinking the game was already won. They were wrong. Arsenal quickly silenced these chants by grabbing 2 goals before half time. Mkhitaryan got the first with a long range effort with his weaker foot. Chelsea’s record signing and most expensive goalkeeper ever, Kepa, probably should have saved it. The second, scored by Alex Iwobi just 4 minutes after Mkhitaryan’s goal was well-struck into the roof of the net from around the edge of the six yard line. 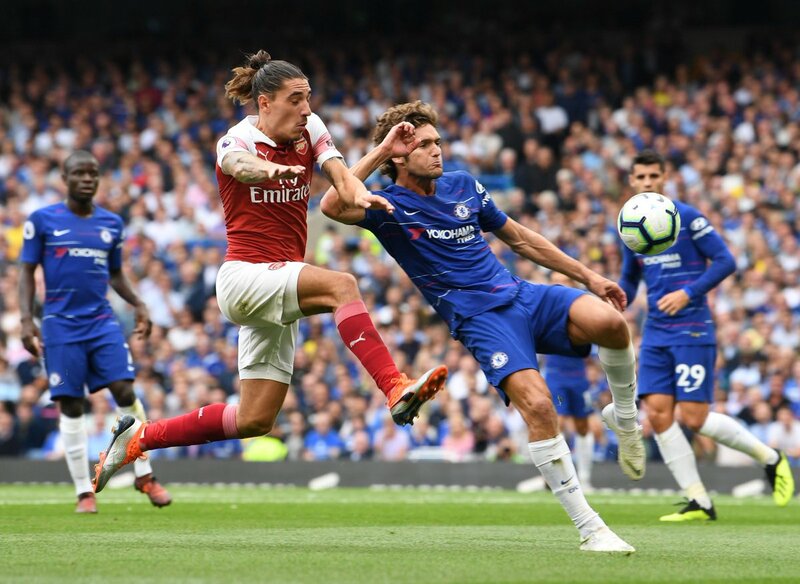 Chelsea’s tactical naivety, on the other hand, was highlighted when they failed to deal with Arsenal’s plan of doubling up on the wings, and then cutting the ball back to either Aubameyang or the winger on the opposite side. This tactic was so effective from Arsenal and should have seen them score at least 2 or 3 more. Both Aubameyang and Mkhitaryan were guilty of missing key chances. Even after this, Chelsea failed to recognise the plan and this was the cause of Arsenal’s two goals. One thing i must say, that is a pleasant change from Wenger, is that Unai Emery made a half-time, tactical substitution. This saw Xhaka come off in place of Arsenal’s new-signing, Lucas Torreira. A half-time substitution is something we very rarely saw under Wenger, especially towards the last few seasons. Torreira solidified the Arsenal midfield. However, he was partially at fault for Chelsea’s 3rd goal as he failed to track Alonso’s run. This is something that Xhaka gets slated for regularly, yet I have seen few people mention Torreira’s flaws in this match. In the second half, Chelsea had most of the attacking momentum and this increased in the 61st minute, when Willian made way for Eden Hazard. Then, in the 80th minute, Arsenal substitute, Alexandre lacazette, lazily gave the ball away which saw Hazard retrieve the ball. He went past Lacazette with ease to then, ironically, play a perfectly executed cutback to an unmarked Alonso who slotted the ball through Cech’s legs. Overall, I felt as though Chelsea deserved to win. They were the better team and had almost all the attacking momentum. It will take some time for the Arsenal players and fans to get used to Emery and his system, they just need to be patient with him. Having to face reigning champions, City, and FA cup winners Chelsea in your first 2 Premier League games is never easy. I thought Kanté and Barkley were fantastic. Especially Kanté in his more advanced role, almost as an attacking midfielder/false 9. Guendouzi also impressed me. For a man who is just 19 years old, he showed great determination and bravery, as well as his passing ability. In the first half he achieved 100% passing accuracy. The passion shown by Guendouzi when Aubameyang missed his glaring opportunity is also something to be admired. Ultimately, things look like they can only improve for Arsenal but Emery will probably need more than 1 season in order to get back in the top 4, just based off the first 2 performances. Chelsea, however, after gaining 6 points from 6, are beginning to look very promising.